TXAB: The Christ Almighty Blog: Synoptic gospels: The three gospels which sync up. Synoptic gospels: The three gospels which sync up. In other words, all the gospels but John. SYNOPTICS sə'nɑp.tɪks plural noun. The synoptic gospels. SYNOPTIC GOSPELS sə'nɑp.tɪk 'ɡɑs.pəls plural noun. The gospels which show a great deal of similarity in stories, wording, structure, order, viewpoint, and purpose. Namely Mark, Matthew, and Luke. You’ll notice in my articles on Jesus’s teachings I often line up the different gospels in columns. ’Cause they’re telling the same story, but in slightly different ways. But even so, they sync up rather well. The phenomenon is pretty well described by the Greek word σύνοψις/synopsis, “see with [one another],” so three of the gospels get called synoptic. John is an obvious exception. I can sync it up from time to time, but nowhere near as well. Its author was clearly telling his own stories. 4 so you might know with certainty about the word you were taught. —and it turns out he availed himself of those sources. Mark included. But—no surprise—there are Christians who have a big problem with the idea the gospels’ authors quoted one another. Including some scholars. Some are bugged by the idea of anybody quoting anybody. What they’d much rather believe is that each of the gospels’ authors wrote independently of one another… and all their stories happen to match. Miraculously. Which would definitely convince them the gospels are reliable… but nobody else. Y’see, talk to any police detective and they’ll tell you: When every witness’s story lines up too perfectly, they colluded. No question. A more reasonable problem, which bugs a lot of Christians, is the idea of Matthew quoting Mark. Because the apostle Matthew was one of the Twelve, who personally followed Jesus and learned from him directly. Whereas the apostle Mark was a student of Paul, and later Peter… and therefore didn’t learn about Jesus firsthand like Matthew; he learned about Jesus secondhand from Peter, and thirdhand from Barnabas and Paul. All this stuff was confirmed by the Holy Spirit, but still: Why on earth would Matthew quote Mark? What could Mark possibly know that Matthew didn’t? So these Christians’ theory goes like yea: ’Twasn’t Mark, but Matthew, who wrote his gospel first. (Maybe even in Aramaic, the language of Jesus and Matthew’s homeland, instead of Greek.) Then Mark later published an abridged Greek version of Matthew. And Luke later quoted Mark… or Matthew; whichever. Meh; it’s not entirely outside the realm of possibility. But we’ve no proof there’s an Aramaic original of Matthew, and we don’t know why Mark would want to write a shorter gospel instead of including every Matthew story. But the more important thing to remember is the names we attached to the gospels—Matthew, Mark, Luke, John—were attached there by tradition. We don‘t actually know who wrote ’em. They’re anonymous. The apostles and prophets put their names on their books and letters, but the authors of the gospels felt Jesus is way more important than them, so they left their names off. Deliberately; the author of John called himself “the student Jesus loved,” and the only John in his gospel is John the baptist. We think we know who wrote the gospels, and it’s entirely possible we got the right guys. There’s some hints in Luke/Acts that Luke’s the author, and many more hints in John that John bar Zebedee wrote it. But Mark actually has no such hints. Nor Matthew. Matthew might not have written Matthew. Or it was some other guy named Matthew who wrote it, who’s not the same Matthew in the Twelve. The most likely theory—the one most scholars go with—is this one. The (hypothetical) sources of Matthew and Luke. The pie charts indicate what percentage of the text comes from what source. Somebody, whom we’ll call Q (for Quelle, German for “source”) put together a collection of Jesus-sayings—either by writing them down, or getting Christians to memorize them. We don’t have a copy of Q anymore, but we can deduce it by noticing all the places Matthew and Luke line up. Somebody wrote Matthew in the mid-60s, using Mark and Q’s collection as two of his sources. And of course he had some other sources, which we find in his gospel, and only in his gospel. We’ll call them M.
Somebody wrote Luke round the same time, doing the same thing, with his own sources, which we’ll call L.
And since John doesn’t quote any of these guys, we usually figure he’s his own source. Many scholars figure John read Luke and decided to compose his own gospel, filling in any blanks he felt Luke had. That’s the four-source theory. 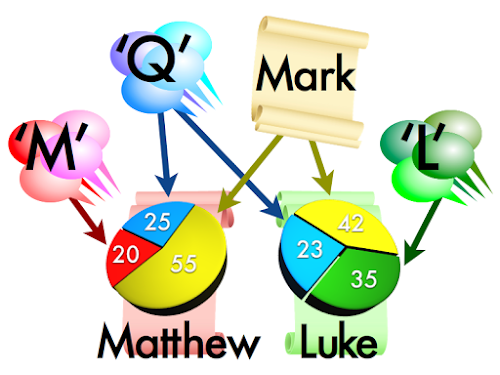 There’s a form of it called the “two-source theory,” which claims Matthew and Luke (like John) were their own sources, and supplemented themselves with Mark and Q. But how would Luke have been his own source?—we’re pretty sure he didn’t follow Jesus round the Galilee, so he had to get his data from other people. In any event, being your own source means that’s still a source… so, four sources. Because the synoptics don’t line up perfectly, they create what scholars call the synoptic problem—which of them is the most accurate version of the story? Because inherent in that question is another, bigger, more problematic question: Which of the gospels got it precisely right… and which of them got it wrong? And that’s not an idea biblical inerrantists like to have raised. They’re entirely sure the whole bible, including all four gospels, have nothing wrong. No exaggerations, no inaccuracies, definitely no errors. The very idea Luke told the story correctly and Mark told the story incorrectly, in any way whatsoever… well, some of ’em will throw you out of their churches for saying so. My point of view, obviously, is the authors of the gospels weren’t striving for that level of precision. (If they were, every Jesus quote would’ve been left in its original Aramaic!) They were trying to share what happened, and generally got it right. If you want it exactly right, you’re seeking the wrong thing; you should be seeking Christ Jesus himself, not a perfect book. This being the case, the synoptic problem is only a “huge problem” to those people who are trying to become know-it-alls instead of Christ-followers. And if you imagine the bible has no “difficulties”—no discrepancies, no inconsistencies, no contradictions—it’s because you haven’t actually read the bible. Or you’ve prioritized your church’s favorite teachings over what’s actually in the scriptures. Don’t do that. That’s how you, and your church, go astray. For the most part, the gospels are gonna harmonize. They’ll tell the same story—sometimes in unison, with the very same words; sometimes with different details, depending on what the author prefers to emphasize. Which is fine. Don’t force them to all sing the same tune. Pay attention to the slightly differing points of view. They’re all looking at the same thing—and their differences are how we get a 3-D picture of what actually happened, instead of a flat view. But I’ll admit it: When I write about the gospels, and come across a “difficulty,” I try to harmonize it as reasonably as I can… and if I can’t find a reasonable explanation, I gotta point to one of the gospels and say, “I’m going with that narrative.” Usually it’s John, ’cause John wrote about what he personally witnessed. But when the synoptics disagree, I tend to give Mark first priority. And to be blunt, every Christian prioritizes a gospel. They have a favorite; they go with their favorite. When they like Matthew best, when Matthew and Luke give us different genealogies for Jesus, they claim Matthew’s genealogy is the biological one, and Luke’s is the adoptive one (i.e. Joseph’s ancestry)—so Matthew gives us the real genealogy, ’cause our culture prioritizes biology over adoption. (Jesus’s didn’t.) Never mind that both genealogies say they’re Joseph’s. And sometimes these Matthew fans give reasonable explanations for why they made their choice… and sometimes their explanations aren’t reasonable at all. But every Christian does it. Don’t pretend we don’t. Mine is pretty basic: Mark was written first. It’s a source both Matthew and Luke quote. Not that I have any intention of disregarding the other two gospels: They fill in the blanks where Mark is silent. But if there’s any discrepancy between them and Mark, I take Mark’s side, ’cause I figure he’s nearer to the source material in time—and got a lot of his info from Simon Peter, Jesus’s best student. Now when there’s no Mark version of a story, and Matthew and Luke don’t quite jibe, that’s more difficult. I can’t say, “Well Luke was written before Matthew,” ’cause I don’t know whether it was—or if it even matters which gospel was written first. Most of the time we Christians go with our biases, and that’s never smart. I try to find similar stories and themes elsewhere in the gospels and the New Testament to help me decide. It’s a difficult process. But the which-takes-priority question very seldom comes up. The three gospels present different points of view, but they do sync up—and often John provides some insights which also help our interpretations. The Holy Spirit provided us with multiple points of view because it takes multiple points of view to really understand Jesus. He’s not two-dimensional. So we mustn’t reduce him to a flat image when God’s given us stereo.